Working at Life magazine as the negative assets manager, Walter Mitty (Ben Stiller) is a constant daydreamer, stuck in his daily routine of work, sleep and daydreaming fantasies. He has a crush on a co-worker, Cheryl (Kristen Wiig). Sean O’Connell (Sean Penn), a photojournalist, works closely with Walter, sending him photo negatives for him to process. In the movie, Life magazine is being closed down and converted into an online magazine. Sean sent Walter a roll of negatives, together with a wallet with a note to ‘look inside’ and life’s motto embedded in it. He also writes that he wants negative No.25 to be the cover for the last magazine before it closes down, but Walter can’t find it. The annoyingly rude corporate transition manager Ted Hendricks (Adam Scott) bugs Walter for the negative, also bullying him because of his daydreaming. Walter tries to stall for time and uses the negatives Sean sent to him as clues. He tracks Sean to Greenland. In Greenland, a bartender tells him that Sean has gone on a ship. A drunken person assaults him without any reason but Walter manages to subdue him, discovering a clue on him. The drunken man is actually a helicopter pilot and recalls flying Sean to a ship. Walter hesitates to follow the man as the man walks out the door, but when Sheryl appears in the bar and starts singing ‘Space Oddity’ to him, he gathers his courage and jumps for the helicopter even though it’s already off the ground, just in time to hang onto its landing skids. He is too late to reach Greenland, where he tracks Sean to and just catches a glimpse of him as Sean flies atop a plane to photograph the eruption of Eyjafjallajokull, disappearing into the ash cloud. Ben Stiller directs this slightly narcissistic story of a dreamer who constantly drifts into worlds of his own. He is portrayed in his daydreams as heroic, stoic, greatness and adventure but he never seems to live them out in the real world, until Sean’s ‘mistake’ forces him to search for it for the sake of his beloved magazine. This story takes him, and the audience, around the world, seeing things that he would have seen from his office in the basement of the Time magazine building. He starts getting less and less reveries as the story progresses, but starts being more and more of the character he fantasizes about being when he had his head in the clouds. This movie, an adaptation of James Thurber’s classic short story The Secret Life of Walter Mitty, is pretty sappy and my little brother who was watching it with me gagged a few times. But… it really made my mind go BOOM. When I was younger, I’d always dream of being able to wander the earth like a free soul, without any worldly worries. I grew up and realised I wasn’t an albatross, but here a meaningful slapstick was, telling me my dream could be possible. I could travel the world, see the wonders, and be free like I always wanted to. Of course there would be financial stuff and all that hoo-ha, but that could always be solved, some way or another. Finance is never a problem when faced with passion. Walter lives a new life compared to his old, monotonous one: he jumps onto a flying helicopter, skateboards down hills, faced a clan chief armed only with Clementine cake and climbs a mountain range to find his friend. If he couldn’t do that in one week, imagine what all us dreamers can do in a lifetime! I have to admit that the romantic scenes in the film are terrible. They’re too sappy and unrealistic, though the cinematography compensated for it. They took their shots at the real locations, without any CGI involved. The magnificent landscape of the crystal waters of the Greenland Sea, the winding roads of Iceland and the Himalayan mountains that are covered with a blanket of snow and glittering ice are absolutely fantastic. I’ve never seen such beautiful sceneries in my entire life. Sean O’Connell said in the film that sometimes, you just want to be stuck there forever, in that beautiful moment, just so you could see it over and over again. 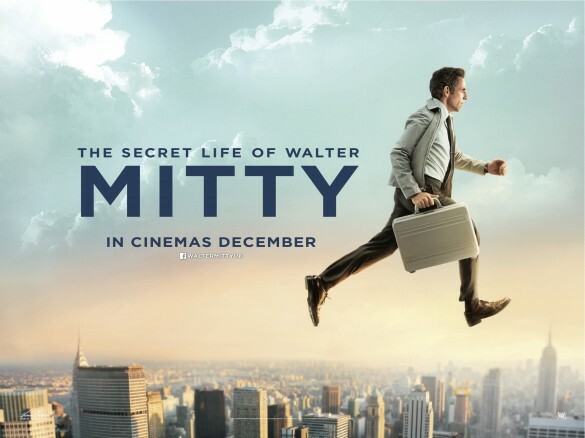 I hope this film, if you ever watch it, will encourage you to strive to find that moment to keep, because that’s what I believe why Walter Mitty was ever created: to help us, to inspire you to dream bigger and bigger.